Happy Bin Cleaning is a locally owned and operated Vancouver based business. We are not an international franchise so money spent on our service will find its way back into our local economy by creating jobs, funding community initiatives and sharing profits with local charities and the local community. Happy Bin Cleaning was created in response to local municipalities deciding to separate compost waste from other residential waste. At Happy Bin Cleaning we recognize the importance of this initiative. We also understand that it has resulted in garbage bins which smell terrible and are full of harmful bacteria, bugs and other pests. We are here to help everyone turn their dirty stinky bins into Happy Bins. Nobody wants to clean garbage and compost bins that are full of rotten food, oily sludge and harmful bacteria such as E. coli, Listeria and Salmonella. We get it and we want to help by CLEANING, DISINFECTING and DEODORIZING your bins. Let us do the dirty work for you for the cost of a fancy cup of coffee. We come to your bins on your regular garbage collection day to CLEAN, DISINFECT and DEODORIZE your bins. Our custom cleaning system uses high-pressure hot water to blast away the dirt, grime and stink from your bins. After we CLEAN your bins we DISINFECT them with our biodegradable hospital/restaurant grade disinfectant. This kills the harmful bacteria in your bin. We also take the time to DISINFECT the handles and lid you regularly touch leaving your bin clean and safe. Finally we DEODORIZE your bins leaving them fresh and clean smelling. A clean bin is a Happy Bin and a Happy Bin will not attract rodents, raccoons, bears and other critters. By using our cleaning service on a regular basis you will find it more pleasant to throw out the garbage, and feel safe knowing that the surfaces you touch have recently been disinfected. 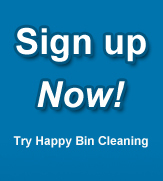 At Happy Bin Cleaning we strive to be the number one bin cleaning company in Canada. Our staff is dedicated to helping Canadians by CLEANING, DISINFECTING and DEODORIZING their dirty and stinky bins in a friendly, timely, professional and environmentally friendly manner. At Happy Bin Cleaning we want to contribute to the health of our communities. We believe in promoting a sustainable environment and active living for our children. For these reasons we have committed to sharing a percentage of our corporate profits with KidSport Canada and the David Suzuki Foundation.